Who are the Jams (the 'just about managing')? The government is expected to promise help for Jams - those "just about managing" - in Wednesday's Autumn Statement. But who makes up this group? For former Labour leader Ed Miliband, the "squeezed middle" was a concern. Ex-Lib Dem leader and Nick Clegg, while deputy prime minister, often referred to "alarm clock Britain" - the bleary-eyed grafters struggling to raise families, while getting out to work, with little money left over to pay for luxuries. Conservative Chancellor George Osborne concentrated on "hard-working families" - again, those not on huge wages, but juggling responsibilities and striving to keep going. This week, in his first Autumn Statement, Mr Osborne's successor Philip Hammond is expected to promise help for the group described by officials as Jams, the households "just about managing" to avoid poverty - and feeling left behind by globalisation. Many consider themselves to be part of this demographic grouping, with wages having suffered since the financial crash, while house prices in many parts of the UK have risen and inflation has fluctuated. According to the Resolution Foundation think tank, those "just managing" - the insertion of the word "about" makes for a better acronym - are made up of six million working-age households on low to middle incomes. They are spread across "areas as diverse as Pendle in Lancashire, Sandwell in the Midlands and North Devon". Are you just about managing to get by? You can email haveyoursay@bbc.co.uk with your experiences. Jam households have at least one person in work, but are half as likely to have a degree as the rest of the population. The Resolution Foundation says they are not always "low-income" households. Those making as much as £50,000 a year could be included, if they have several children to feed and clothe, it adds. Most of their incomes come from work, but they are often topped up by welfare support. In fact, Jams account for two-thirds of all families with children receiving tax credits, the Resolution Foundation says. More than two thirds have less than a month's income's worth of savings. So, the argument goes, Jams are especially vulnerable to weak income growth, rising costs and the freeze on working-age benefits until 2019. 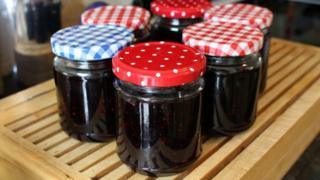 The Treasury does not have a formal, income-based definition of Jams, but the government has provided some strong indications of its thinking. In her first statement as Prime Minister, Theresa May, attempted to reassure this group, saying: "If you're from an ordinary working-class family, life is much harder than many people in Westminster realise. You have a job but you don't always have job security. "You have your own home, but you worry about paying a mortgage. You can just about manage but you worry about the cost of living and getting your kids into a good school. If you're one of those families, if you're just managing, I want to address you directly." Mr Hammond made similar sounds on BBC One's Andrew Marr Show on Sunday, saying he would support people "who work hard and by and large do not feel that they are sharing in the prosperity that economic growth is bringing to the country". The Resolution Foundation says home ownership among the "just managing" fell from 59% in 1995 to 26% last year, meaning that many more face paying rent into old age. The group's senior economic analyst, David Finch, has said: "This switch from owning to renting means that 'just managing' families are now having to set aside a quarter of their income on housing. As a result they have suffered over a decade of lost income growth. "Many of the problems families face - from falling home ownership and disappearing career ladders - are very deep-rooted. Reversing these family misfortunes is a huge task, but the right one to focus on." Mr Hammond has given away little of what his Autumn Statement will bring, although there is speculation he will freeze fuel duty. And it has been suggested the chancellor will cut air passenger duty to help offset the costs of overseas holidays, made more expensive since the fall in the value of the pound following the Brexit referendum. Mr Hammond might offer help with savings, too, pundits say. Whatever happens on Wednesday, we are likely to be hearing a lot more talk about JAM households.